The rate of return sought should be dependent on the amount of intelligent effort the investor is willing and able to bring to bear on his task. The minimum return goes to the passive investor, who wants both safety and freedom from concern. The maximum return would be realized by the alert and enterprising investor who exercises maximum intelligence and skill. Graham remarks that the common 25/75 splits of bond/stock allocation that is typically offered to a defensive investor as a sound plan may no longer hold with the markets at their current highs (1972). As I’ve remarked in previous writings, I think he would say the same for our current 2016 price levels. Given the pricing situation at the time, Graham instead suggests that the truly defensive investor should seek a 50/50 split between bond and equity holdings. Looking at other common allocation philosophies I think it’s challenging for anyone , at any time, to truly be satisfied with their decision of allocation. For example, right now it wouldn’t make a ton of sense to have a heavy allocation in bond markets given the low interest rates, but if things in the equity markets went south, a portfolio return could quickly become sour causing the investor the wish they had been positioned differently. The point is, no approach is guaranteed, but the emphasis is on some strategy that continues to extract emotion from your investments. In this case, Graham is comfortable with a 50/50 allocation for the defensive investor, even noting that while the returns may be only one sided, in the event of a market shift, the defensive investor is positioned to continue with an upswing on the opposite side of the market. The investor must always account for their risk profile, market trends, and information they’ve learned to help facilitate their allocation decisions. Once that allocation decision is set, the time comes to choosing the right security in each category. As one begins to search for different bonds, the first question Graham focuses the investor on is the issue of taxable or tax-free bonds. Secondly, the issue of the length of maturity of each bond : shorter- or longer-term maturities? The answer to both questions above come down to arithmetic with a focus on the investor’s tax bracket. Speaking generally he mentions that most individual investors would do better after taxes with good municipal (tax-free) bonds than they would with good taxable corporate issues. The loss of the possibility of an appreciable gain in principal value. He mentions we’ll get to some of these questions further in the book at Chapter 8. U.S. Savings Bonds (note: Graham mentions Series E and H bonds, as of 2004 these issues are no longer available) — income is taxed Federally but not at a State or Local level. In Graham’s view , while the rates will be lower, the strong backing of the U.S. Government as well as the tax advantages of these bonds make these a nice option for someone interested in safe bond issues. 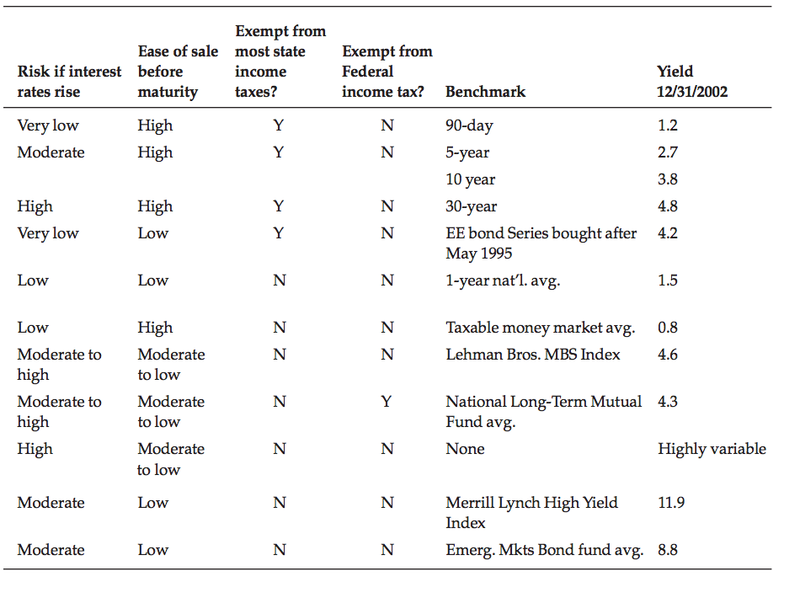 Other U.S. Bonds — Income is taxed Federally but not at the State or Local level. These bonds are going to consist of issues from the U.S. Government that are considered and created typically under a particular department of the Government for a particular purpose. The example Graham gives is where U.S. backed bonds were issues by the Secretary of Transportation. Thus, while the issue isn’t exactly a U.S. savings bond, it’s still backed by the full strength of the U.S. Government. State and Municipal Bonds — These are free from Federal income tax and are usually free from State income tax as well but may charge local income tax. In this case, while usually safe, Graham makes mention that not all tax-free bonds are strongly enough protected to justify their purchase by the defensive investor. 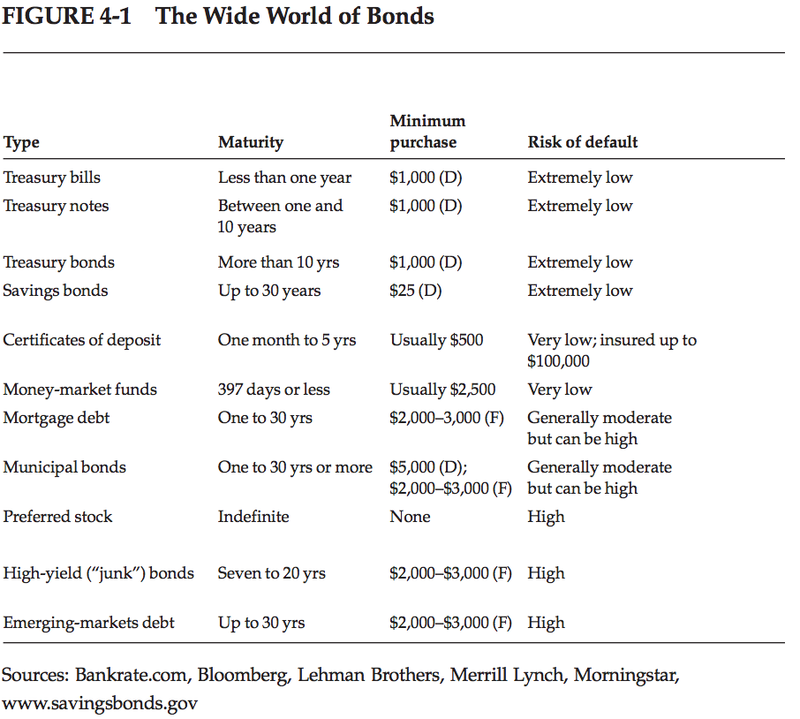 Sticking only to AAA rated bonds in this category is recommended. Corporate Bonds — Subject to both Federal and State income tax. These typically offer the highest yield but present the most risk as they are not backed by any governmental entity. As a positive note though, the company is responsible to the bond holder before the stock holder, so if there was a default, your bond holding in Company A would get paid before any equity holdings. Higher-Yielding Bond Investments — often associated with a substantial amount of risk. These “junk” bonds can be bought at a low price with a high-upside but an equally high risk of default. Zweig makes mention of the investor’s ability to leverage “junk bond funds” if they did want to get into this space but help limit the risk. Having covered quite a few dimensions of common stocks in previous chapters Graham takes an opportunity to speak on Nonconvertible Preferred Stocks. He focuses on making his point that: “Preferred Stocks should only be bought on a bargain basis or not at all”. His rational being that the preferred shareholder becomes dependent on the ability and desire of the company to pay dividends on its common stock. The company only pays the preferred shareholder dividends if, and only if, it pays dividends on its common stock. We then transition quickly into Zweig’s commentary on Chapter 4 which I think is some of his best commentary so far. He further undermines the concept that your asset allocation is age dependent by offering examples of how your age may not accurately depict your current financial situation or goals. Again we see an emphasis of understanding who YOU are, what YOUR risk profile is and your financial aspirations as they fit into the current and perceived future markets. He also makes mention of something Graham does not. Cash. Making note that any asset allocation can be handled by any investor, but that all investors should keep a cash reserve, or equivalent , just-in-case. This aids in the investors perception of their solvency and can help beat down any emotional bias that may come into play. Further expounding on concepts of keeping a reserve, Zweig comments that Graham suggests that any investor should try and keep a minimum of 25% bonds at all time. The logic here being that even in a major stock market downturn, the 25% bond allocation should be able to offer another emotional cushion to rest on to keep the intelligent investor from liquidating his stocks at low prices. Basically, the 25% bond allocation might not always be a winner , but when the market drops, it’s a great anchor to keep the investor’s spirits high enough to not have an all-out emotional “firesale” of their equity holdings. Zweig also comments on understanding your income investment goals from the perspective of tax advantages and time frames. He mentions ensuring any of your bond holdings outside of tax advantaged accounts should be tax-free bonds since it’s unlikely you’re in the lowest tax bracket which means you’ll be taxed on any income coming from any taxable bonds. He adds advice that most investors should focus on intermediate bond maturities as it will help to remove the investor from speculating what way the interest rates of the markets will go. He goes a bit deeper into bond diversification and mentions that while it’s possible to diversify your bond holdings, it’s typically more advantageous to leverage bond funds, instead of outright bond holdings. This is because these funds typically offer low fees, help you diversify without having to own $10,000 in each bond type and you can often reinvest your monthly income without paying a commission. If this company is healthy enough to deserve my investment, why is it paying a fat dividend on its preferred stock instead of issuing bonds and getting a tax break? No intelligent investor, no matter how starved for yield, would ever buy a stock for its dividend income alone; the company and its businesses must be solid, and its stock price must be reasonable. As I continue to work through the chapters, my goal is to post on each chapter’s central tenants. If you find something out of place, or care to strike up a discussion feel free to comment or find me on twitter @DavidCappelucci.